A high-end cheesecake flavor offers a real taste of curdy cheesecake in your favorite baked. Add a drop to give you a yummy cheesecake taste. 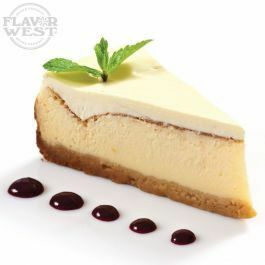 Type: Cheesecake Water Soluble Flavoring. Ingredients: Natural Flavoring, Propylene Glycol. USP Kosher Grade Flavoring. Usage Rate: 15-20% for E-use. Flavor suitability: Suitable cakes, yogurt, ice cream, pudding, coffee, tea, cream, and much more. Specific Gravity: 1.05 No Refunds on Flavoring. This flavor is the best to mix into almost anything. Adds a cream to the mix. Just add this to a fruit formula around 5% and you'll know you have some thing different. Changed how I mix my own formulas over night. Thank you Flavor West for such a great flavor. Use very very sparingly. This is a very strong flavor.